The square pyramid is one of the Johnson solids. 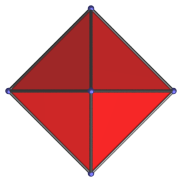 It is bounded by 4 equilateral triangles and 1 square. It is the first polyhedron in Norman Johnson's list, and thus bears the label J1. It can also be attached to the sphenocorona (J86) to make the augmented sphenocorona (J87). Top view (apex-centered parallel projection). Parallel projection centered on triangular face. Projection parallel to base. The base square face projects to the bottom edge of the projection image. Projection centered on a base-to-apex edge. The image of the apex coincides with image of one of the vertices of the base. Last updated 15 Mar 2019.